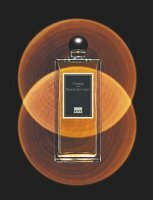 Cèdre was released by Serge Lutens this year, around the same time as Bornéo 1834. Both fragrances were created in collaboration with nose Christopher Sheldrake. Cèdre joined the export line while Bornéo was launched into the exclusive line. Why? I don't know. The notes for Cèdre are tuberose, cloves, cinnamon, amber, musk, and cedar. A friend described the top notes of Cèdre to me as spiced apple cider (or just a spiced apple? I have a terrible memory), and that is apt, although perhaps spiced, wood-aged hard cider comes closer. It is very rich and warm and sweet, with fruity undertones and just the slightest hint of the mentholated opening of Tubéreuse Criminelle. As it dries down the tuberose intensifies, but it is not the hothouse variety, nor is it the cold, silky tuberose from Tubéreuse Criminelle, but rather something very soft and quiet, and muffled by the wood and a honeyed amber. The cedar itself is surprisingly subdued; it is a very woody fragrance but it has none of the sharp edges I commonly associate with cedar. There is a whisper of something animalic — leather, maybe — and a trail of something smoky and dusty and dry weaving through the sweetness in the final stages. It has a velvety, almost-powdered musky finish. Serge Lutens is one of my favorite fragrance lines, but the cedar-based scents in the Bois series do not by and large appeal to me, and I am still not sure what I think of Cèdre. The first time I tried it, I thought it was too much sweet amber and too little cedar and tuberose, but I have worn it 4 or 5 times since then and it is starting to grow on me. Just this morning I was caught up short by lingering traces on the jacket I wore yesterday. This is how I ended up addicted to Ormonde Jayne Ta'if, another scent that I did not care for the first time I tried it. Time will tell. Cèdre is an Eau de Parfum. For buying information, see the listing for Serge Lutens under Perfume Houses. I am so glad to hear that you are warming up to Cedre! Needless to say, it is one of my favourites, with its beautiful tuberose and sweet cedarwood notes. Wonderful review! I did find Cedre to be one of those scents that “grew” on me. I am enjoying it a lot now–it's a wonderful Fall fragrance. I also found out (either here or on V's blog) that it layers quite well with A la Nuit, and I particularly like that combination! I sense an incense-like finish to Cedre. I did not like it at first either, but it does have a way of growing on you. Although it's definitely worth testing, I don't think I will add it to my fragrance “wardrobe”. I also felt this scent growing on me, I don't yet crave it, but I find it a pleasure whenever I dip into my decant. I do have a perfume pal who described it as drunken plum, which I thought was great! I am jealous of the fact that you did get a wiff of something animalic there To me it was juts a gentle, smooth “bois” of some sort, not easily identifiable as cedar or any particular wood at that. I still might get a bottle, simply because I just can't find a way to buy the beloved Bois Oriental instead. My bottle of Cedre arrived today. I fell in love with this one on first try. A strange medical cough mixture type note which I find so addictive. The releases in the last few years from the export line,did not grab me enough to buy. But Cedre was the one which did. behaved and sits well with the spice and woods. R, yes, it could be incense! I don't know what it is, but it smells dusty/smoky to me. Some reviews have suggested tobacco leaf. It almost smells more like woodsmoke to me. M, Gentle & smooth is about right, and the animalic stuff is extremely light. I would love to have a more detailed list of the notes. Assume you've tried ebay for Bois Oriental. I don't own a single bell jar, and afraid to buy one. 2.5 ounces is 1.5 ounces too many! W, yes, drunken plum is a perfect description! I have 2 samples & will use them up before I decide if I need a bottle myself. D, did you buy it unsniffed then? That is very brave! I agree about the tuberose…I love tuberose, but many people don't & I don't think it matters much for Cedre. You could hate tuberose AND cedar and still like it. I bought Cedre unsniffed too – and I still don't really know what it's supposed to be. I get a brief suggestion of cedar, but the rest is floral with an underlying oily note. The advertising copy about tigers and whatever seems utterly out of keeping with what, for a Serge, is a fairly timid creation. At least there's no cumin. I bought this one unsniffed and haven't regretted it. I am not a tuberose fan in general but this one is so well done, mixed with the woody and resinous smells, that it doesn't upset me at all. I am also fortunate to own a bell bottle of Bois Oriental, which I prefer (it's my favorite SL) but Cedre is a nice addition to my collection as well. R, I love Cèdre ! It´s such a wonderfull fall fragrance! My first impression was: “Oh no, that´s nothing I want to wear!” I was rather dissapointed, but it really grew on me & at the end of the day I was in love ;D. My bottle arrived on monday – I couldn´t resist any longer. Hi N, I completely agree that despite the spices, it is less blatantly exotic than most of the SL wood fragrances, and it certainly doesn't call up a wild animal. I can't decide myself if it is timid, or just not what I expected from the name & the notes, so therefore a bit of a letdown initially (?) And LOL — yes, at least there is no cumin that I can smell! T, lucky you on the bell bottle of Bois Oriental! I almost bought a bottle of Iris Silver Mist, then decided it was more than I would use. But do want to have a bottle — just because — one of these days. S, Wow, from disappointment to love in one day! You work faster than I do This one I will probably set aside for a month and then revisit. And saving money is always a good thing! NOPE! I tried and tried to love this, but there was one funky note that ruined it for me….may have been the actual cedar, LOL! Ah, a synthetic that pleases you! I loved Cedre on the first sniff and it is one of those rare perfumes when I do get any compliments. Haha! Smart? No way – it takes me ages to like some too – read my post on your review of MdB! Cedre just clicked. BTW – I tried Melodrama (a friend sent me a sample) and it is GORGEOUS!! Mwah! I love love love Cèdre. I have a small decant on my desk and regularly sniff it. It makes me go, “Aaaaah!” just as Fleurs d'Oranger does. It's subtle and unusual. Beautiful! J, thanks for the page, it is a great resource! I have a tiny decant of Cedre but had put off trying it because my success with SL in general has been rather limited. Insert sad face here. Having said that, TC & Fd'O make me do the happy dance and Cedre developes beautifully on me. The inital honey note bugs me but that's true, no matter the maker. I may “need” more of this one. One odd bit, excessive inhaling makes me a bit woosy headed. I've gotten headaches from perfumes before but never smelled one that just made me dizzy. Oh, I have my little favorites in the synth world, and they tend to be either classics that don't use the *harsh* synths* that dominate so many scents today, or modern fumes with synths that blend seamlessly and don't shout out their testtube birth. That's ironic, since this S.L. borrows its cedar heavily from Shiseido Feminite du Bois and its heavy dose of iso e super! The lady has been in her garden too long. But I would not call Iso E Super a harsh synth by any means, would you? As soon as I put this on, I thought “a sweeter Angelique Encens.” Shortly after I caught a whiff of what reminded me of Escentric Molecule- the Iso E Super, I guess. (As a relative newbie to the world of niche goodies, I am sooooo proud to have identified these!) It has now mellowed and melted into divine. I LOVE this SL!! I was completely overwhelmed in Liberty today, and I remembered reading this review and being intrigued by the cedar/tuberose/spiced apple mixture and had to give it a spritz. It is absolutely gorgeous, I loved it. It seemed very rich on my skin, and very elegant and comforting all at once. It has regenerated my interest in the Export line – I turned my back on it for a while, because I had a few ‘misses’ and was more intrigued by the Exclusif options! But Cedre led me to sample Chene, Rousse, Chypre Rouge, Fille en Aguilles………….wonderful, absolutely wonderful stuff. I’m gonna have to give the line a thorough exploration again, as obviously my tastes and appreciations have changed since the ‘early days’ of perfumista infancy. It’s so great to read your reviews, Robin as they inspire reflection and reconsideration, revisitation and rediscoverery! Oh how nice, I’m so glad!! I think the divisions between the export & the exclusive lines are not the same as before, esp. now that they’re putting so many of the scents that were previously exclusive into the export line. There really aren’t all that many now that you can’t find in an import bottle — except, of course, my absolute favorites! Ah! Which are your absolute favourites Robin? I know for a fact that you will include Iris Silver Mist and Tubereuse Criminelle, but any others?! Those two, and Rahat, although I do not love Rahat nearly as much as the other two and possibly only think about it because I cannot have any, LOL….it does seem odd that those are nearly the only 3 older scents that have not gone into export in the time since I’ve been interested in perfume (I’m probably wrong, there are probably others — but it SEEMS like everything else can be bought here). To me, Cedre smells overwhelmingly of pear when I first spray it on, which I find not entirely likeable but I do love the dry down. What I love about most Serge Lutens perfumes is the journey – they always seem to combine moments of discord with moments of pure joy. Except maybe Daim Blond which I have to say I think of has ‘damn bland’ every time I put it on. Interesting! I do not get pear. Hope they have not reformulated it…was just reading not good things about the latest versions of Daim Blond, by coincidence.